includes SMALLER PORTION of all the jerky you love, just at smaller proportions. includes a LARGER PORTION of all the jerky you love. 2 ounce pack of Black Pepper Turkey. 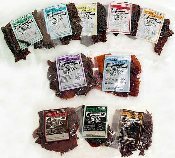 1.75 ounce packs of Exotic Buffalo, Venison and Wild Boar.